DAKS currently offers three types of guided tours throughout the summer. Each tour includes knowledgeable guides to explain the sights, sounds, smells, and history of Ocean City’s waters. Call 609-938-1185 to schedule a tour for your family, friends, or team. Birthday parties and other special event tours are available. SUP, YO? Grab a paddleboard, hit the water, and find your inner and outer balance. 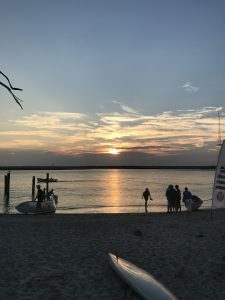 Our tour guide will take you to a secluded spot in the sheltered back bays of Ocean City and guide you through yoga while you’re on the paddleboard. This tour will last 1.5 hours. $50 adults/$35 kids under age 10. Discounts available for groups of eight or more. 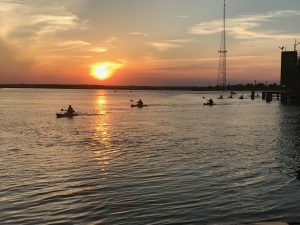 Explore the marshes and back bays surrounding Ocean City by kayak or stand-up Paddleboard. Daily tours are led by trained naturalists who know the local ecosystem and wildlife. Get up close and personal with osprey, terrapin, heron, and other species seen in the salt marshes. $45 adults/$30 kids under age 10. Discounts available for groups of eight or more. What is more beautiful than watching the summer sun set over the bay? Join DAKS’ guides for a 1.5 hour paddle through the bay and enjoy spectacular, unobstructed sunset views. Novice and experienced paddlers welcome! $45 adults/$30 kids under age 10. Discounts available for groups of eight or more.